Overall the winter was 1-1.5C milder than average, and total rainfall across the region was typically 100-120mm, approximately 75% of the long term average of 125-150mm. There were fewer than average frosts across the region particularly in February where most stations only had one or two air frosts. December and February were both milder than usual. February in particular was 1.5-2.5C above the 1961-1990 average with spring-like temperatures in the second half of the month, the maximum temperature reached 17.1C at Santon Downham on 20th February. Along with warm maximum temperatures there were also mild minima with fewer than average air frosts in both December and February. 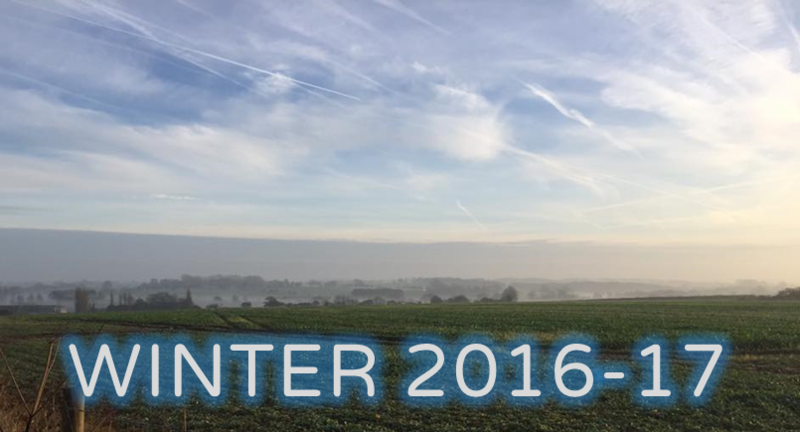 In February an average of only two air frosts were recorded at the six weather stations used for this report. 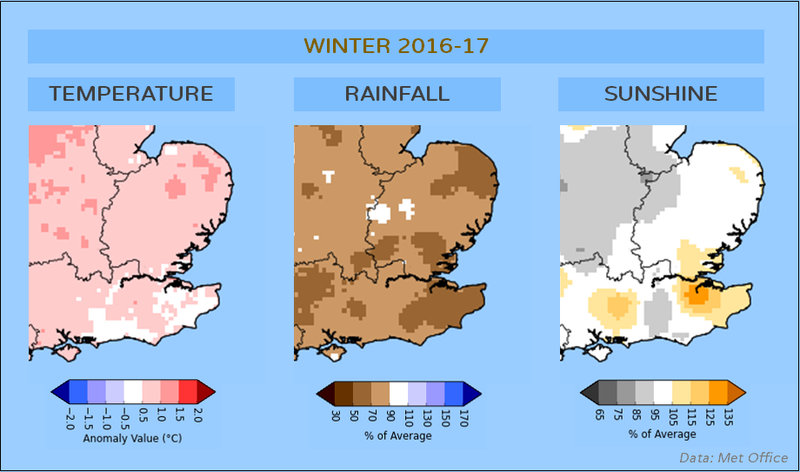 In January the average temperature was approximately 1C lower than typically, the only notably chilly month of winter, it also saw the coldest temperature of winter -7.8C at Santon Downham in the early hours of 22nd Jan.
December was a dry month across the east of England with rainfall totals of 17-25mm, around 50% of average. Both January and February had rainfall totals of between 30-50mm which is around or slightly below average. December 10th was widely with the wettest day of the winter but with less than 20mm of rain recorded, thankfully there were no flooding problems this winter. Sunshine amounts for the winter were above average with 176 sunshine hours recorded at Wattisham. January in particular was a bright month with 75 hours reported, 20% above average. The Met Office only named 5 storms between November and February. Strong winds were noticeably absent in December and January with maximum wind gusts not exceeding 52mph at either Wattisham or Marham during either month. On February 23rd it was Storm Doris that had the largest impact across our region. There was a gust of 81 mph recorded at Weybourne on the Norfolk coast, gusts of 65-70 mph were reported quite widely inland across the region. This caused some disruption to transport with power outages and numerous fallen trees (as shown above). January was the only colder than average month of winter and 2016/2017 saw remarkably few days with lying snow in our region. There were only seven days on which falling snow was reported and no ice days recorded at the six stations used in this report. February was remarkably mild particularly during the second half of the month.